Successfully Added Presentation Laser Pointer with Mouse Function to your Shopping Cart. Presentation laser pointer with mouse function for teachers, professors and business orientated individuals. This laser pointer comes with cursor navigation control function for scrolling UP/DOWN while performing presentations. This ergonomically designed laser pointer with mouse control function comes in black with chrome finish on the sides. The CVBJ-K37 allows the presenter to be more versatile during their presentations. Communicating through radio frequency to the USB wireless receiver, this great device makes scrolling through Powerpoint slides easier than ever while allowing you to use the laser to highlight important information all at the same time. With a extra long transmission range of 20 meters, you have plenty of space to move about and be active during your presentations. This is a simple plug and play device, no drivers needed and its ready to be used straight out of the box. This makes the laser pointer with mouse function more flexible in its use, meaning you can use it on any laptop or computer, whether the computer belongs to you or someone else, all you need is a USB port and you are good to go. This is the perfect tool for the urban professional. Get one for yourself and buy a few more to give to your friends and colleagues (who wants to have to share?). Or you can even just buy one for yourself and sell the rest to pay for your purchase while making a profit at the same time! The CVBJ-K37 is in stock right now and available at a factory direct low wholesale price from Chinavasion. 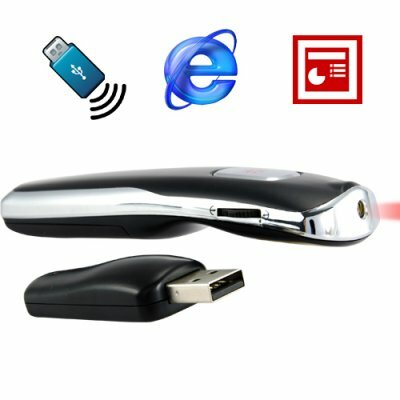 Will this laser pointer with mouse function work on MAC laptops? Yes it should, no drivers are required for the installation of this model. You can purchase a sample, and let us know what you think by posting a review. Is there also a click function on this presentation laser pointer with mouse function? No, there is only a scroll UP/DOWN function, with an independent laser button.